One of the best aromatherapy diffusers that we have come across, without a doubt! Create the atmosphere you want! Professional quality diffuser with at a reasonable price. Pure therapeuitc quality essential oils are broken into minute particles and delivered as mist through an ultrasonic ventilator. The Spa Vapor Mist diffuser gently but steadily emits a soft feathery mist into the air infusing your home with moisture and the essence of what ever esential oil or stock blend you choose. The use of essential oils can create a wide variety of moods from energizing to relaxing. Many of our clients use this diffuser before bedtime to assist with relaxation and sleeping. Since this unit turns off automatically when the water level drops below the water level sensor, this is perfect! 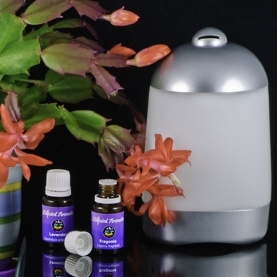 The Spa Vapor Mist diffuser works equally well in the office or at home. It is small enough to fit on your desk or night stand. The calming LED lights automatically change colors to create a calming environment. You can even opt out of the color if you wish and only experience the mist. Use only Tap or "drinking" water. If your water contains a lot of minerals, add one tablespoon of lemon juice every 2 weeks. This will release any deposits that may have formed on the vibration disk. Your diffuser should not be filled to the top with water - just to the red fill line. If your fill line disappears, 2/3 cup of water will fill the basin to where the fill line was. When using essential oils, 6-8 drops of essential oils is all that is required. If you use oils in your diffuser be sure to rinse with very hot water every 3 days to avoid buildup. Run time varies depending on humidity in the room- simply add water and oils to keep the unit running. The lights on the unit will flicker when the water level runs low, indicating that it is time to refill the unit. If left without being refreshed, the unit will simply shut itself off.